Flowers: A large, orange or yellow fluffy disk surrounded by many narrow orange rays bending slightly backward, 2" wide, fragrant. Bloom: Spring and summer, sporadically the rest of the year. Fruit: Tiny tufted seeds, usually sterile. These plants are not self-fertile and two plants are needed to produce viable seeds. Leaves: Green, with a long, pointed heart shape, thick. Stems: Green, narrow, rounded. They root at nodes where they touch the ground. Roots: Fibrous. This plant is invasive when its stems are allowed to touch moist soil. Wildlife: Attracts butterflies and bees. USDA hardiness zones: 8b-13. It dies to the ground below 20°F but comes back from its roots. Sun: Full sun for the most flowers. Water after becoming established: Once or twice a month, weekly in the hottest months of the year. Soil: Well drained, dry, low in organic content, pH 6.1-7.8 (slightly acidic to slightly alkaline). Avoid fertilizing because that inhibits flowering and causes aggressive growth. This plant is salt intolerant, so chemical fertilizers must be avoided. Mulch: Use organic mulch to shield the roots from winter freezes, especially in zone 8. Planting: Can be grown in a container. Prune: Cut back the tops of the vines to reinvigorate leaves and flowers at the bottom. This may need to be done twice a year. Propagation: Cuttings or layering. The seed will not be viable unless derived from two plants. Uses: Ornamental, butterfly garden. It is best grown on a trellis, fence or draped over a wall so that the stems are not on the ground. 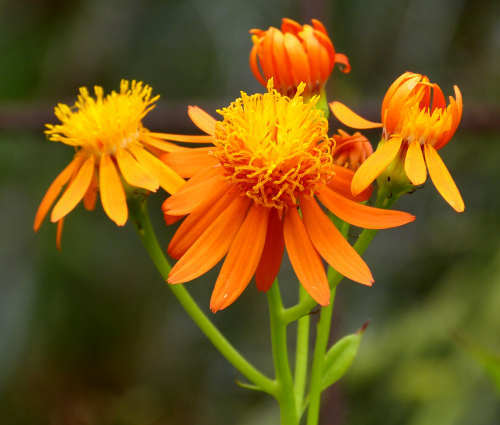 Senecio confusus is a member of the Aster family (Compositae). This plant is sometimes designated by the invalid scientific name Pseudogynoxus chenopodiodes. It tends to lose leaves and flowers from the bottom up, so the vines have to be cut back to reinvigorate the bottoms. The best way to prevent this vine from flowering is to  keep it away from full sun,  fertilize it, or  grow it in overly enriched soil.